National University of Science and Technology NUST is ranked among top universities of Pakistan. Their main focus is to provide quality education to its students along with creating career opportunities for them. NUST merit is very high due to number of applicants, last year they have received more than 30,000 applications. If you are able to score anything between 130 to 150 in entry test you have a good chance of getting admission but if anything less than that your chances will become less. NUST entry test is considered to be one the toughest engineering test, so all those students who are willing to apply for NUST NET they should start preparing for that now. Pakprep.com provides best and simplest online preparation platform for all those students who are willing to get admission in any engineering university of Pakistan. 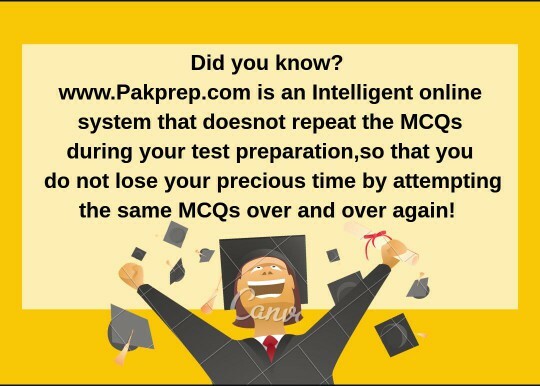 Pakprep.com have more than 15000 solved quality MCQ’s along with explanation prepared by professionals. We have all relevant material students need to prepare for NUST NET or any other engineering test. MOCK test will help students to understand how to utilize time in an efficient manner. Smart analytics will keep you updates with all of your weak areas. To start preparing yourself for any engineering test please CLICK HERE. 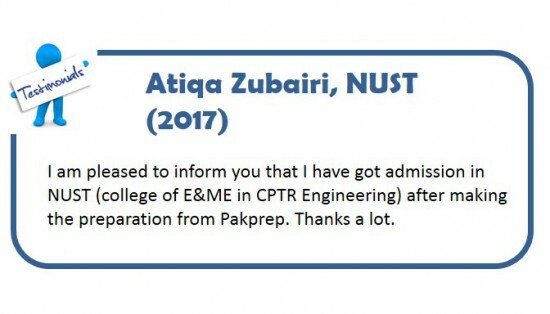 This entry was posted in NUST and tagged Best website to prepare for NET-I, Best website to prepare for NUST, Best website to prepare for NUST NET-I, How to prepare for NUST, How to prepare for NUST NET-I, Mechatronics Engineering closing merit, NET-I explained MCQ’s, NET-I MCQ’s, NET-I MOCK test, NET-I past papers, NET-I solved MCQ’s, NUST, NUST Aerospace Engineering closing merit, NUST Avionics Engineering (Risalpur) closing merit, NUST Bachelor of Industrial Design, NUST Bachelor of Military Art and Science, NUST BBA (Hons. ), NUST BE (Telecom), NUST BE Aerospace (Aviation Mechanical), NUST BE Avionics (Aviation Electrical), NUST BE Chemical, NUST BE Civil, NUST BE Computer, NUST BE Electrical, NUST BE Environmental, NUST BE Geo Informatics, NUST BE Industrial and Manufacturing, NUST BE Materials, NUST BE Mechanical, NUST BE Mechatronics, NUST BE Software, NUST BS Accounting & Finance, NUST BS Architecture, NUST BS Computer Science, NUST BS Economics, NUST BS Mass Communication, NUST BS Mathematics, NUST BS Physics, NUST BS Public Administration, NUST Civil Engineering closing merit, NUST closing merit, NUST closing merit 2017, NUST Computer Science (Islamabad) closing merit, NUST Computer Software Engineering closing merit, NUST Electrical (Telecom) closing merit, NUST Electrical Engineering closing merit, NUST Eligibility Criteria, nust entry test, NUST entry test expected dates, NUST entry test expected dates 2018, NUST Environmental Engineering closing merit, NUST explained MCQ’s, NUST Geo Informatics Engineering closing merit, nust mcqs, NUST Mechanical Engineering closing merit, nust merit list, NUST merit list 2017, NUST MOCK test, NUST NET-I, NUST NET-I eligibility criteria, NUST NET-I entry test, NUST NET-I expected dates, NUST NET-I explained MCQ’s, NUST NET-I MCQ’s, NUST NET-I MOCK test, NUST NET-I past papers, NUST NET-I solved MCQ’s, NUST Past Papers, NUST Software Engineering closing merit, NUST Solved MCQs, online NET-I preparation, online NUST NET-I preparation, online NUST preparation, Sample NET questions, Sample NET-I Chemistry questions, Sample NET-I Math questions, Sample NET-I Physics questions, Sample NUST Chemistry questions, Sample NUST Math questions, Sample NUST NET-I Chemistry questions, Sample NUST NET-I Math questions, Sample NUST NET-I Physics questions, Sample NUST Physics questions, sample NUST questions, Where to prepare, Where to prepare for NET-I, Where to prepare for NUST, Where to prepare for NUST NET-I, Where to prepare for NUST NET-I entry test on October 27, 2018 by Pakprep.com Admin. We appreciate your interest in using Pakprep.com. Sorry we do not have last year merit list and you scored good enough marks we think you will be able to secure your admission.